When it comes to memorable collectible coins, the Perth Mint’s Lunar Series II coins are undoubtedly the most popular options for many. The proof version of silver and gold coins from this collection offer beautiful designs and excellent appearances. 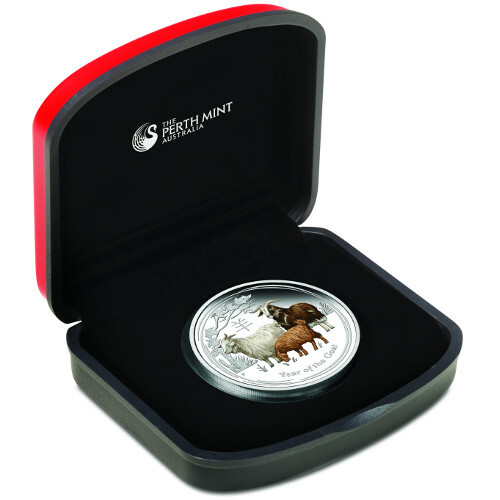 The 2015 1 oz Proof Colorized Silver Australian Goat Coin is available today on Silver.com in its original box. Ships to you in a Perth Mint black-and-red box with a CoA. Mintage limited to 9,000 coins only. Eighth release of Lunar Series II. Year of the Goat design, with full color, on the reverse. The Lunar Series II collection from the Perth Mint is a 12-coin collection that features gold and silver products, with both bullion and proof versions of the coin. The Perth Mint also releases limited-issue coins within the series, such as these beautifully colorized proofs. 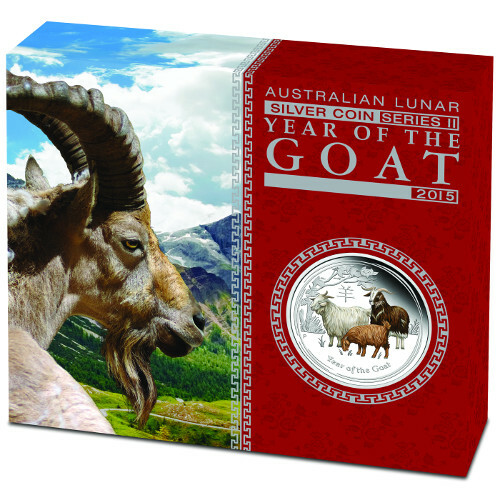 Each of these 2015 1 oz Proof Colorized Silver Australian Goat coins helps commemorate the Year of the Goat on the Chinese Lunar calendar. The eighth animal of the Zodiac, the goat represents those born in 2015 and every 12th year going forward and backward in time. Those born under the sign of the goat are said to be elegant, charming, artistic, gifted, and calm. 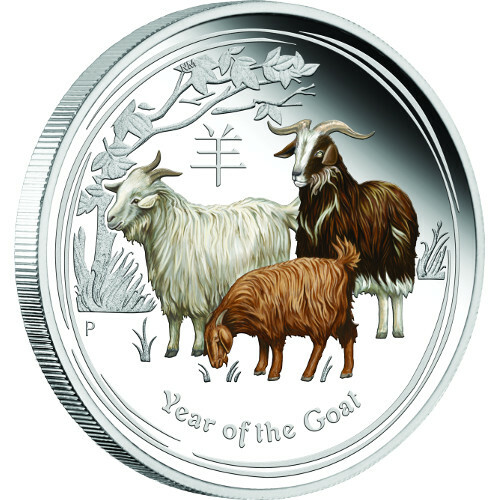 On the reverse of the 2015 1 oz Proof Colorized Silver Australian Goat coin you’ll find the 2015 Year of the Goat design, complete with brilliant colorization for the three goats in the grazing herd. The male goat to the right has a dark brown; the female to the left has a white finish, and the baby goat has a reddish-brown coat color. The obverse of all 2015 Year of the Goat silver coins features the Queen Elizabeth II effigy. 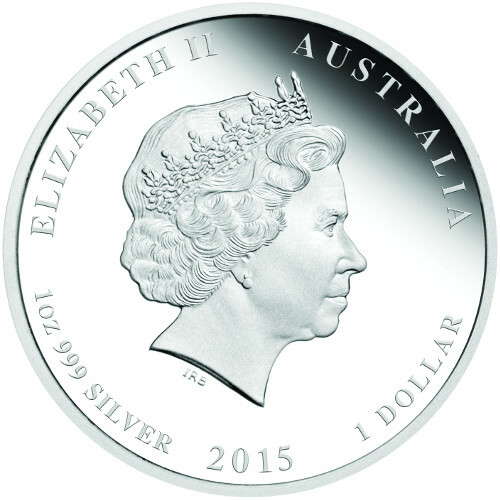 Her Majesty is always featured on Australian coinage in right-profile relief with her name, the nation of issue, and face value included in the design field. All 2015 1 oz Proof Colorized Silver Australian Goat Coins in this release are part of the two-coin colorized proof release that includes a 1/2 oz. proof coin. The 1 oz. coin has a total mintage of 10,000 coins, but only 9,000 are available for individual purchase. Your product ships encapsulated in plastic, set in a Perth Mint box, and arrives in a Lunar Series II shipper with Year of the Goat color artwork. Perth Mint was opened in 1899 as the third and final British Royal Mint facility. Three years later Australian federation occurred, but the Perth Mint remained in British control until 1970 when it was turned over to the state government of Western Australia. We encourage Silver.com shoppers to contact our customer service team. You can reach our associates at 888-989-7223, connect with us through our live web chat, or simply send us an email.